Mr. Fullbright joins the lineage of terse Southwestern songwriters like Townes Van Zandt and Guy Clark, sticking to a few folky chords and reaching for unassailable clarity.—New York Times. Tulsa Roots Music and Gilcrease are proud to present Music on Exhibit, a series of Sunday concerts featuring internationally recognized artists at the museum’s Tom Gilcrease, Jr. Auditorium. The concerts are free with museum admission. The series continues with singer-songwriter John Fullbright. A plainspoken approach is a big part of what’s fueled this young Oklahoman’s remarkable rise. It was just a few years ago that Fullbright released his debut, From The Ground Up, to a swarm of critical acclaim. 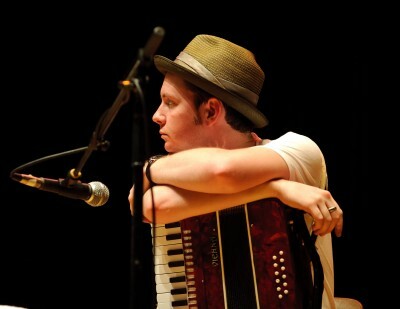 The LA Times called the record “preternaturally self-assured.” NPR said “it’s not every day a new artist…earns comparisons to great songwriters like Townes Van Zandt and Randy Newman, but Fullbright’s music makes sense in such lofty company.” The Wall Street Journal proclaimed him one of the year’s 10 best live performers. The album earned him the ASCAP Foundation’s Harold Adamson Lyric Award. And Fullbright was nominated for a GRAMMY, which placed the singer-songwriter alongside some of the genre’s most iconic figures, including Bonnie Raitt. A Tulsa favorite, Fullbright has performed on the Late Show with David Letterman, Prairie Home Companion, and NPR, among others.